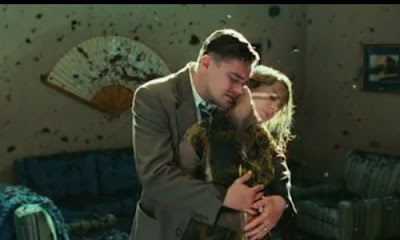 It's heartening to think that there is a large audience that desires a major motion picture of substance, grace and elegantly restrained craft , the sort of movie that director Martin Scorsese's "Shutter Island" longs to be, but that's slim consolation for those who sat through the movie's two hours and eighteen minutes. One of things I like Martin Scorsese for is that he's an extreme movie fan--at his best he's what Quentin Tarantino wants to be, blessed with an observable genius--and one appreciates that he wanted to make something in the style of Val Lewton. Lewton's productions were distinct and elegant, but they were also taut, tight narrative lines leading to increasingly nerve racking results. As with Brian dePalma, who never learned that lesson for all his stylistic obsession with Hitchcock, Scorsese doesn't glean that from any of the suspense masters he 's viewed. Lewton, though, didn't poke around his set ups nor erupt with gratuitous verve as Scorsese often does; his thrillers "I Walked With a Zombie", "Cat People" and "Body Snatcher" , though rife with a psychological nuance, were stylish and efficient engines of excitement. Ninety minutes, more or less, was what it took for the problematic results of a protagonist's plight to slam you up against the wall. Irony , effectively deployed , was essential to Lewton's artistry, a wrinkle, a turn, an unexpected result that could alter the entire tone of the film; Scorsese, too often arty and not at all artful, hasn't the slightest grasp of the ironic touch. The twist in "Shutter Island"--the man investigating a disappearance in an insane asylum is himself insane--startles no one; the audience is basically tipped off by the escalation of weird events. Believability has nothing to do with it; rather it's more plausibility, the extent to which you're willing to suspend disbelief to allow the genre to work it's distractions on you. The delusional nature of Leonardo DiCaprio's character was as unexpected as a phone bill. Another issue hampering the film's effectiveness is DiCaprio's youthful appearance; seasoned law enforcement officers don't look like they just got back from a shoot for Tiger Beat. He compensates , or tries to, by scrunching up his face in sustained series of prune faced close ups, but the effect is of a watching a man suffer through a bad headache, an unintended irony for the viewer waiting for the movie's quality to improve. Relief came, of course, in the form of the end credits.